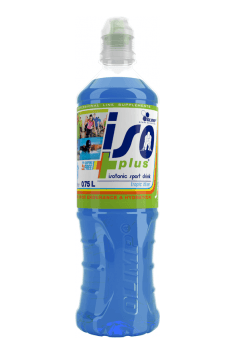 Olimp Iso Plus is an isotonic drink that helps maintain optimal hydration status and electrolyte concentration during physical exertion. It contains quickly digestible carbohydrates, as well as B group vitamins involved in the energy transformation. The product is ideally suited for people practicing high-intensity sports, team sports, running or cycling, leaving no unpleasant feeling of dryness and stickiness after eating. An isotonic drink has a similar content of sugars and electrolytes to those found in the body's fluids. Similar osmolality ensures effective hydration and quenches thirst, and also helps to maintain the right concentration of electrolytes, necessary for the efficient work of the body. The drink is a source of glucose characterized by a high glycemic index (IG = 100). It is immediately absorbed from the digestive tract, without causing any discomfort from the digestive system. The maltodextrin contained in the drink is in turn a complex sugar, which is gradually released into the bloodstream, despite having a high glycemic index (IG = 110). The use of two sources of sugar allows you to provide instant fuel for your muscles and its constant delivery over time. Sugar is a preferred source of the energy during intense exertion, and its supply allows to extend the duration of the effort and increase the efficiency of the body. Niacin (vitamin B3) is essential for the production of a significant compound in the process of cellular respiration and energy production, namely nicotinamide adenine dinucleotide (NADH). Niacin contributes to reducing the fatigue and oxidative stress. Pantothenic acid (vitamin B5) is used to synthesize coenzyme A, which is an essential coenzyme for many biochemical reactions in the body. The supply of vitamin B5 may increase the body's tolerance to various types of stressors and also ensure the proper functioning of the nervous system. Vitamin B6 participates in the processing of food for the energy and synthesis of hormones and neurotransmitters. It provides efficient transmission of impulses in the nervous system, supports the use of muscle glycogen and reduces the level of inflammation in the body. Biotin (vitamin B7) is involved in the metabolism of glucose and fatty acids, energy and insulin production. It supports the functioning of the immune system, preventing the decrease of immunity during physical exercise. Vitamin E contained in the drink ensures the efficient removal of free oxygen radicals arising from the physical exercise. This prevents oxidative changes in the mitochondria that are responsible for energy production in the body. In addition, the intake of vitamin E may prevent platelet aggregation and promote vasorelaxation, which improves the transport of blood and its nutrients to the skeletal muscles. In summary, Olimp Iso Plus contributes to maintaining adequate hydration and support for energy metabolism during physical activity. Thanks to osmolality similar to body fluids, it quickly and effectively quenches thirst by providing a rapidly absorbable source of energy. The addition of B vitamins ensures efficient energy production and glucose metabolism, while vitamin E helps in getting rid of free oxygen radicals. Take according to the needs, especially during competitions, intensive trainings and hard physical work. The drink ensures the maintenance of proper hydration status during physical activity. It works especially in difficult climatic conditions, including high temperature or humidity. The product does not upset the digestive system, thanks to which it can be used during the activity and after its completion to support recovery. Water, glucose, maltodextrin, acidity regulators - citric acid, sodium citrate, potassium citrate, aromas, stabilizers - gum arabic, esters of glycerol and plant resin; sweeteners - aspartame, acesulfame K; dye - E 133; preservatives - E 202, E 211; antioxidants - E 306, E304.